Samuel Pritchard Matheson (d.1942, aged 90). Bishop Matheson was the first native-born Bishop of the Diocese, having been born in the Red River Settlement in 1852. His maternal grandfather was John Pritchard, one of the settlement’s leading citizens and his father’s family were of Selkirk settler stock. Matheson was educated at St. John’s College. He taught at St. John’s College School and was also the Chancellor. In 1875 he was ordered to the diaconate by Archbishop Machray. In 1902 he became Dean of the Cathedral, then Bishop of Rupert’s Land in 1905, and Primate of All Canada in 1909. 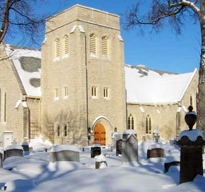 Among Archbishop Matheson’s many accomplishments was the building of the fourth church on this site, the present Cathedral, in 1926. He did much to build the present Cathedral and with his wife, Mrs. S.P. Matheson, spent many long hours making the altar hangings and linens which beautify this Cathedral. Matheson was greatly loved by all who knew and worked with him.